This morning, i got an invite from Google to try out App Inventor. I was personally very excited because, you do not need to be a developer to use App Inventor and develop Android Apps. Instead of writing code, you will be visually designing the way your app might looks and use blocks to specify the app’s behavior. App Inventor runs through a Web browser. Your phone will be connected to your computer through a USB cord and your app will emerge on the phone as you work in the Web browser. When you’re done, you can “package” your finished app to produce an “application package” (Android apk file) that can be shared around and installed on any Android phone, just like any other Android app. The compiler that translates the visual blocks language for implementation on Android uses the Kawa Language Framework and Kawa’s dialect of the Scheme programming language, developed by Per Bothner and distributed as part of the Gnu Operating System by the Free Software Foundation. Complete this form and you will be all ready to build apps soon! Set up your computer and phone for App Inventor. Run through the tutorials that introduce App Inventor. Get help by joining the App Inventor Google Group. Posted in Google and tagged Android, developer, Google. Bookmark the permalink. This is a wonderful tool, maybe a certain advantage Google stands over Apple. I'll surely give this a try as I'm one of the few who has no technical expertise, but a lot bolstered creativity. this is the best I ever came came across…In 4-5 minutes you can develop quiz based apps…they also framed the programing thing as puzzle blocks…now the programming looks puzzle solving….it is quite easy…and no programing is required! 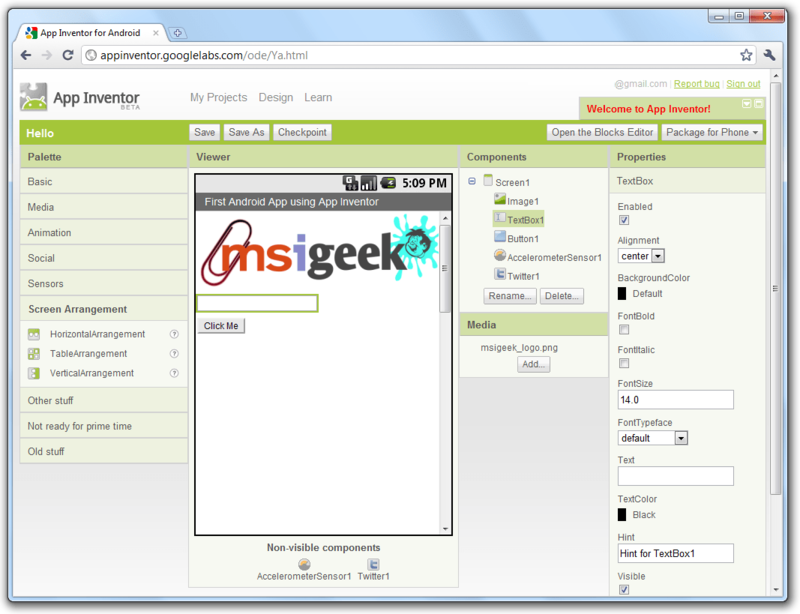 The App inventor has been moved to MIT Google Labs. maintained by MIT. Who is using App inventor, can anyone tell me or post a list.